Who does not know about Sochi?, yes, it is one of football stadiums that is used to effectuate 2018 world cup. It does not only has a football stadium that be able to be visited, but it is also has a lot of interesting things to be known and be visited. Therefore, it is one of popular vacation destinations in Russia that is located in Krasnodar Krai. For further explanation, the writer gives 6 reasons why you should visit Sochi as part of your holiday. Sochi is a city in Krasnodar Krai in which it is located in the frontier of Russia and Abkhazia and it is flanked between black sea and snowy mountains. Existing snowy mountains, it give a beautiful snowy peak background of Caucasus Mountains that can be enjoyed by travellers who visit it. in Caucasus mountains, you do not only see the beautiful view in there, but you also take a picture, play ski boarding and ride the vehicle to be able to reach the snowy peak. Furhermore, they are also able to enjoy black beach in which they are able to travel around it by bicycle to enjoy the views of black beach that offer palm trees and black sand beaches. Even you can see the beautiful of snowy Caucasus mountains in the black beach because they are just 40 minutes away. Beside that, they are also able to use sailing services to enjoy it. After enjoying sailing services, you are able to be enjoy twilight by going to some of places along the coastline Sochi and Adler that start to turn on the lights such as bar and cafe. The bar or cafe in Sochi is had by all of people without looking the social strata so that it is visited by young people, elderly people and even alcohol lovers. For staying, you do not be worry because a lot of apartments and hotels in around there. Russia is a country that has cold temperature. Eventough it has a cold temperature, there is a city that has air temperature that is not colder than cities in Russia; Sochi. If you are traveller who do not like cold temperature, or you are traveller from asean countries or country that has no cold air temperature, you should visit Sochi. In Sochi, you are able to enjoy your holiday in Russia with comfortable air temperature, no cold temperature. This thing is one of reasons why you visit Sochi as part of your holiday. Sochi national park is also known as Sochinsky national park. It was established in May 1983 that has comprehensive park so that it is divided be 3 zones; protected areas of about 71700 hectares. A protected area of ​​about 500 hectares and a regulated area of ​​77100 hectares in which you are able to enjoy some of great attractions for environmental education and development of eco-tourism in there, such as caves, archaeological sites, orekhovskiye, agura, zmeika waterfalls, akh-tsu, prokhladny psakho canyons and many others. In addition, it creates a great habitat for plants and animals so that you are able to find some of animals and plants that do not exist in various worlds. Beside the nature landscapes, you are able to visit historical places in the park like ruins of ancient loo temple, the watchtower, or ethnic museum. From the explanation above, you can see that a lot of great attractions in one place “Sochi national park”. 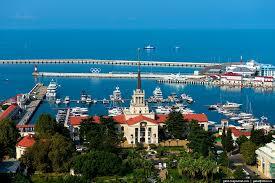 Because of it, you have to visit Sochi as part of your holiday. Olimpiyskiy Park was built to conduct the 2014 winter olympics. Therefore, the name of it is Olimpiyskiy. It is a park that is become as a place for doing sport such as hockey, curling, and skating. It is designed to provide easy access to be used as a training place and competition place that have facilities. Even there is the giant stadium that is used for the game’s opening and closing ceremonies. If you has a child or you like histories, legends and fairy tales, the writer recommend this place to be visited because it is known well as a city that a lot of ancient legends and fairy tales. You do not only get ancient legends and fairy tales, but you are also able to get histories because every place in Sochi has history such as Orliniye skaly, ancient Greek myths, Adyghe legend, and many more. For finding interesting museum, you does not only find it in Yekaterinburg but you are also able to find it in Sochi. For the traveller who like automotive, maybe this is the reason why you should visit Sochi. In Sochi auto museum, you are able to see the antique car of the Kaiser Darring series, Lamborghini Diablo, Aston Martin, to Maserati. Not only them, you can see displays GL-1 replicas by Bushuyev and Zakharov, if you are lucky because it sometimes show displays GL-1 replicas by Bushuyev and Zakharov. For visiting this museum, you only pay 500 rubles for every person. Not far away from Sochi auto museum, there is a museum that is called electrical museum of Nicola Tesla. It is a museum that has high educational value because you are able to know about Nicola Tesla, inventors and scientists who have a big contribution in the field of electricity. Stalin was a dictator. He led Soviet since 1920-1953 that was colored by sharp criticism. In the middle of his reign, he built a house in the summer that is called as Dacha. It was built by being majestic house and painting green color in 1936. At present, it is opened as a museum for tourists. This museum are arranged as the original, such as a private cinema with lots of Charlie Chaplin movie collections. So, for the traveller who like history, especially the history in the era of world war II when Stalin was dictator, you have to visit Sochi as part of your holiday. If you are traveller who like history, you have to visit historical museum in Sochi because it has 12 rooms with a total area of 700 square meters that be able to be seen. In this museum, you are able to find archeological relics and ancient items that are used by indigenous people. Not only it, you are also able to see historical documents that tell the beauty of Russia in which it was inhabited by dozens of kinds of ethnic groups since ancient times. From the explanation above, you can imagine how interesting this museum is. Derevo Druzhby is also called as Tree of Friendship. It is a museum that is dedicated to one tree. One tree in it is a orange tree, a Fyodor Zorin’s work. He wanted to cross wild orange trees with Mandarin orange species. It was done to produce citrus plants that are resistant to winter weather but the result of it is a new citrus species.